Oh I think we all had years at school like that! I think the best year at school for me was 6th Grade. 4th Grade was the year I hated too...how funny. I had no friends in my class. Outside of school was fine because I had my friends I grew up with, but boy did I hate going to school!! My middle name is Rene too. I am so glad you made a special friend that year. Teachers don't always think about the impact on the "good" kid when they do seating arrangements. Ahhh! Ballet! I was the same way about it. I did NOT like it, either. It was much more fun being with the horses, right? My instrument was the piano. Boy, did I ever want to play the viola, but somehow my mom insisted I play piano. It didn't matter what I did or say, she was not going to change her mind! 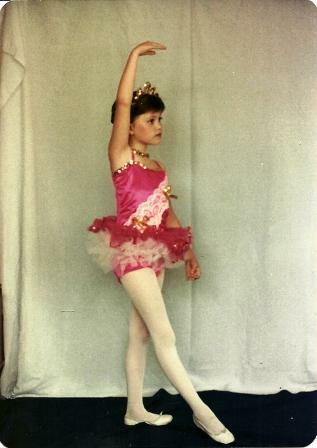 But as much as you disliked ballet, you did look adorable posing in your ballerina outfit! Yikes, I'm experiencing pangs of guilt. My daughter is in 5th grade, but she doesn't like ballet either. Just last night, I was driving her to a lesson and she was not happy about having to go. i hated wearing my hair in a ponytail. hated it. i felt like my face looked funny. i needed my hair. but my mom always tied it up into a ponytail. That was interesting - I don't even remember 4th grade! I hated the year 2003. I bet you were a cute ballerina though. There are years like that. I think most of us have had one. Good thing you didn't stay in that town for very long.